Good also is the high-powered Drive-E engine, which is the first engine I’ve ever encountered that is both supercharged AND turbocharged. The result is a hefty 316 horsepower and equally peppy torque rating. Good too that a roller dial/button on the console allows the driver to choose one of three driving modes, Eco (ugh), Comfort (fine for everyday) and Dynamic (super fun!). 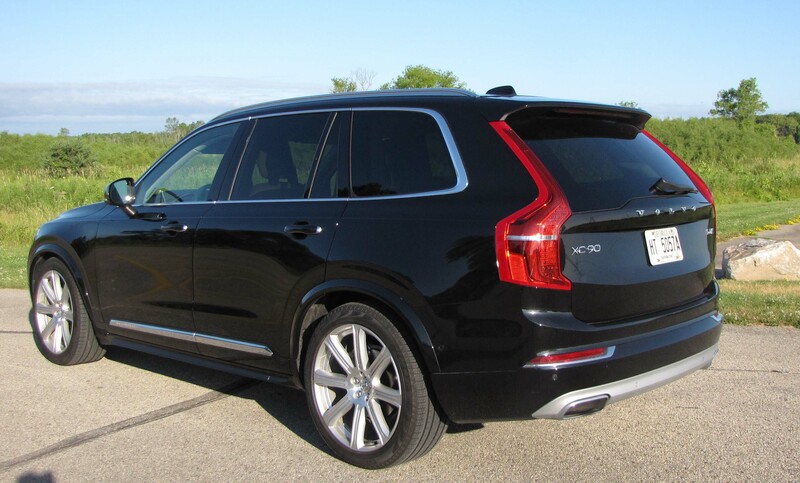 Dynamic changes the 8-speed automatic’s shift pattern to give the XC90 a lot more power off the line. If you need to merge ahead of some slower traffic, this is the setting you’ll want. It makes this 4,627-lb. vehicle feel downright fast. 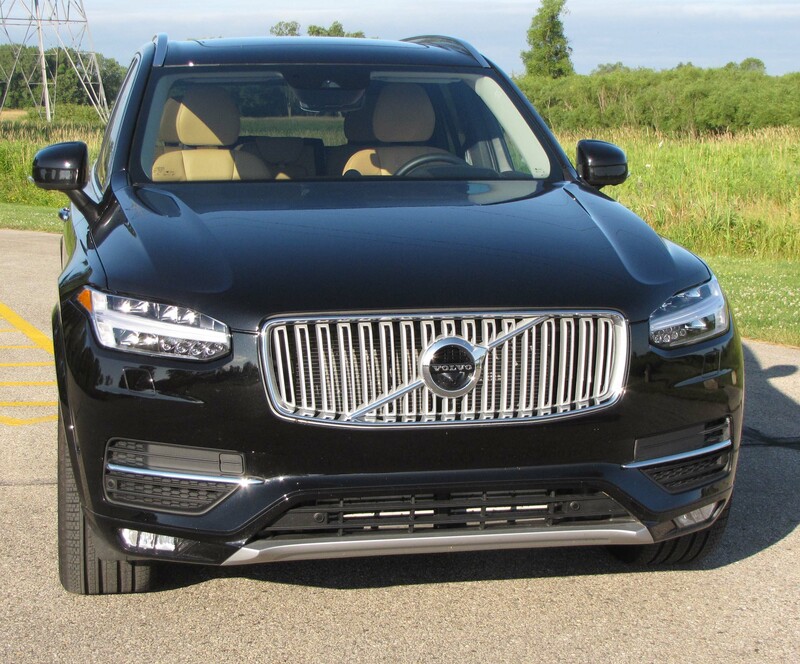 All-wheel-drive is standard on the tested XC90 T6 for now, a two-wheel-drive model is yet to come. That’s fine for us in the upper Midwest where snow and slop make good traction attractive. The Volvo also puts a premium on grip with monster R21 Pirelli tires. Ah, but the XC90 feels as heavy as it is, even heavier. Steering effort is heavy and the crossover feels as if it lumbers, unless in the dynamic mode. Plus there is more float and bounce on the highway than I’d expect and a bit more of a rocking motion than most of us may prefer. There are air shocks here, but they either weren’t working, or are not meant to provide comfort on crumbling cement streets. Several passengers commented on the crossover’s stiff ride and noise from the suspension that emphasized the thump-thump of all the streets’ expansion joints. With a long 117.5-inch wheelbase, I expected better. With the $66,705 asking price I expected more too. Granted the XC90 Momentum starts at $49,895, including delivery charges, but this Inscription model adds a $5,600 package right off the bat. Another 8 options push this to premium luxury status. The interior, minus the suspension noise, would meet the luxury quietness quotient. 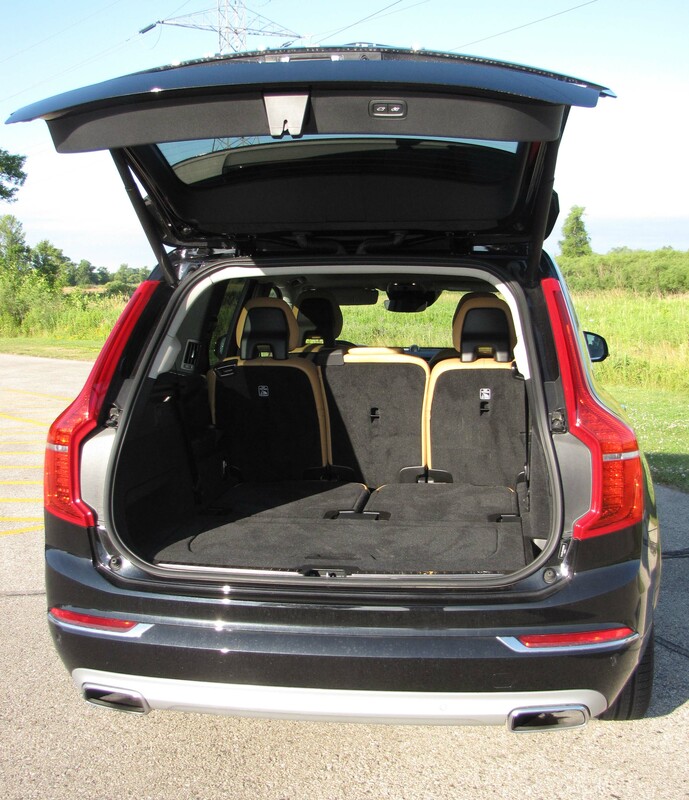 But here is where the details start to work against the XC90, despite its overall attractive appearance, and the fact it offers a third-row seat. First, for that premium price I’d expect powered third-row seats so that I could raise or lower them once I flip up the power rear hatch. Other makes offer this feature. Gorgeous interior with large iPad-like screen. Second, the seats themselves are tough to climb into and offer only modest space. They’re also heavy to lift. Overhead is a panoramic sunroof, which mostly is a plus, but there is only a fine-mesh screen to cover it, so sunny days warm the interior a bit. There are manual side window shades for second-row windows that at least keep reflective sun out of the interior though. Oddly the sun visors also do not slide or extend, a small thing, but a nuisance once the winter sun starts creeping in all those sneaky crevices where a moveable sun visor can help. And quality at this level is expected to be exemplary. Here, the dash’s glove box had a much wider seam near the door and smaller near the center stack, plus the rear floor cargo cover’s handle fell apart in my hand on the first try at opening the hidden cargo space. 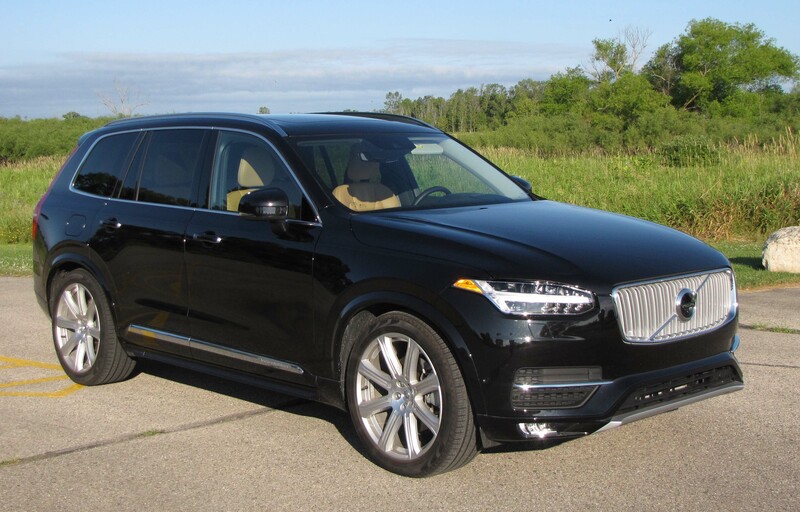 Other than that Mrs. Lincoln … really the aforementioned are too bad because visually the XC90 is stellar with the metallic black test crossover featuring a black dash with tan perforated leather seats. 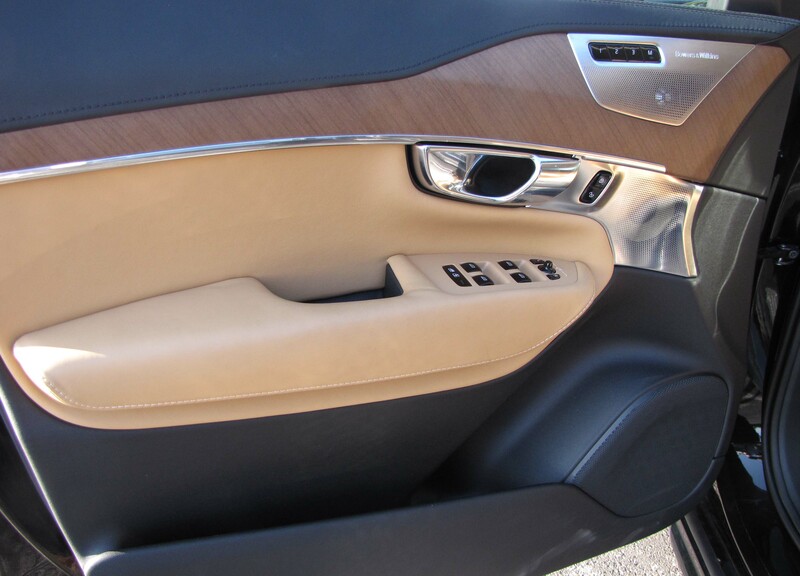 That same creamy soft leather is used on the upper door panels and center armrest. Walnut wood and satin finish aluminum trim on the doors and dash also are impressive and give the interior a high-tech and jeweled look. Door trim, including metal inserts, look high-end and stylish. Controls are easy to see and use, especially that big screen, plus there is the blind-spot warning system in the big side mirrors and cross-traffic alerts and dynamic cruise control to keep you out of trouble. The front and rear seats are heated with the fronts also offering three-level cooling. The fairly thick black leather steering wheel also is heated, all that controlled through the center-stack’s big video screen. Volvo also includes Start-Stop to help the vehicle save fuel, which is another aim of the turbo-supercharged engine. However I managed just 22.2 mpg in about 70% highway driving with only two people aboard. The EPA rates this at 20 mpg city and 25 mpg highway and the Volvo drinks premium fuel. You can view the accompanying stat box for all the options, but as stated earlier, they are plentiful and really push the price up. 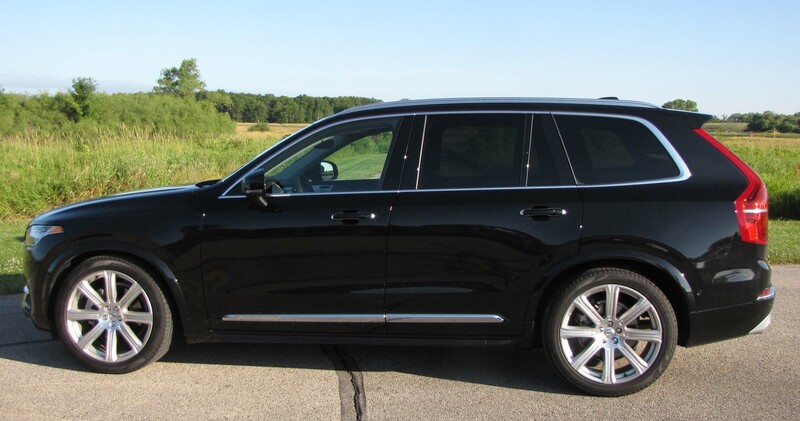 To get the maximum XC90 though you’ll need to move up to the T8 Inscription, which lists at $72,595. 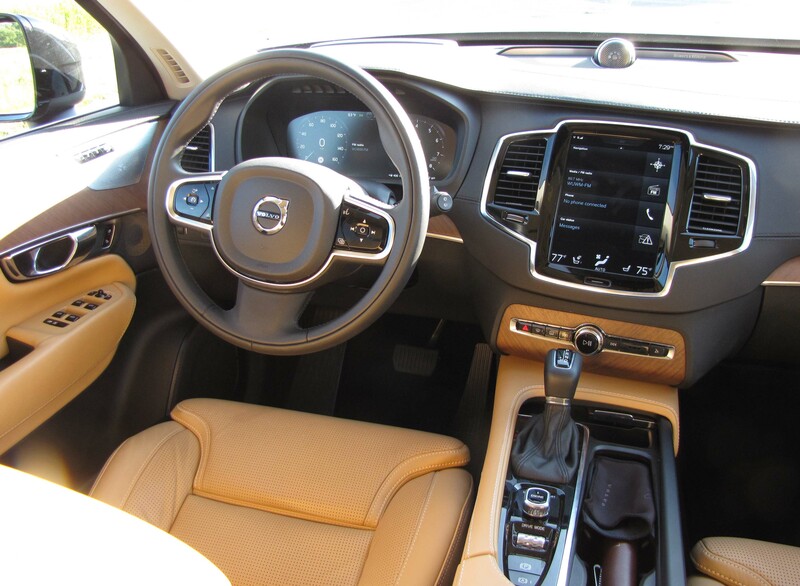 However, if you like the ride and can overlook some of the interior oversights the XC90 offers good interior room and loads of power. With the options it’s as high-tech as nearly any crossover on the market, but as pricy, or pricier, than those models too. Hits: Exceptional power for crossover, plus AWD and quiet interior. Roomy with third-row seat, power hatch, panoramic sunroof, big iPad-like screen, 3 drive modes, blind-spot warning, heated front and rear seat and steering wheel. Cooled front seats and beautiful interior. Misses: Ride is quite stiff and bumpy, suspension noisy, handling is floaty on highway and overall feel is heavy. Awkward non-power third row seats hard to raise and access, handle of rear cargo cover came off in my hand, first pull. Visors don’t slide or extend and giant sunroof has only thin sunshade. Nice cargo room, but third row seats don’t power down. Volvo hater. The car is one of the best in class.